Continual observation and thoughtful reflection are key components of viewing my artwork. My work is delicate and quiet and to fully appreciate these qualities, time spent in sensory engagement is necessary. My work first appears minimal but upon close interaction my strong relationship with and connection to process and skilled craftsmanship is revealed. My work is rooted in the textile practices of weaving, sewing, fabric manipulation, knitting, and embroidery. 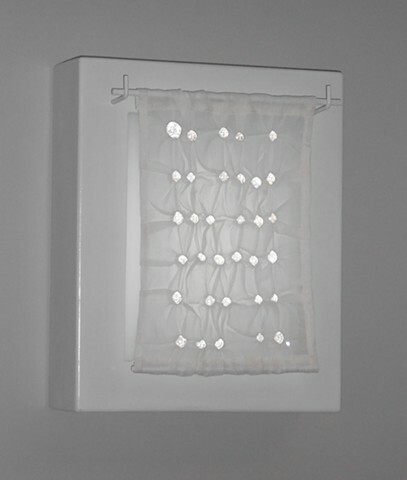 I incorporate the use of plastic as fabric, clear marbles as representatives of time passed, and simple sheer fabric that is unwoven to symbolize the spaces between significant life events. These elements and processes represent memory, meditation, and time, as well as highlight my desire for material exploration while making. As an artist, I developed my personal style from the action of making and response to material. While in college, I found my true interest resided in creating three-dimensional artwork. Weaving yards of material became a great interest and encouraging that material to reside outside of the confines of two dimensions became an obsession. I now think in terms of spatial relationships and strive to create sophisticated and complex works using minimal materials. I rely on subtle traits to communicate a visual language of duality, interaction, and time.